Eco-tourism is not just a buzz word – it can be part of your lifestyle, and even lead to relocation! 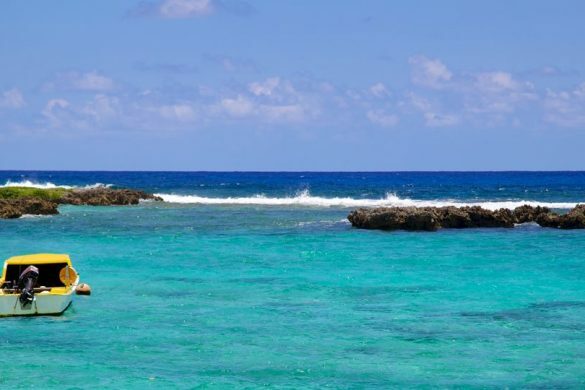 Peter Taylor, vice president of Carnival Cruise Line, will very shortly be managing over 12 of the nation’s cruise ships visiting the coastline of Australia up to and out through the islands of the South Pacific. 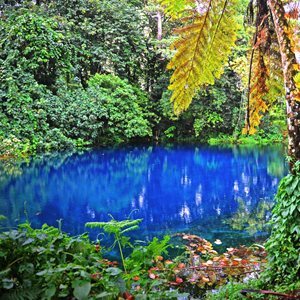 Naturally this incorporates the magnificent ecotourism destination of the Republic of Vanuatu. In this interview Richard Butler and Brian Thomas, co-hosts of ‘Lifestyles and Real Estate of the South Pacific,’ discuss with Peter Taylor details of the amazing growth of the cruise industry. 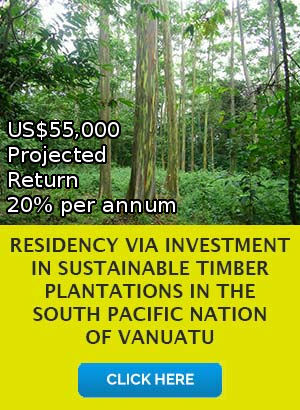 Peter confirms the opportunities are available in the Republic of Vanuatu. 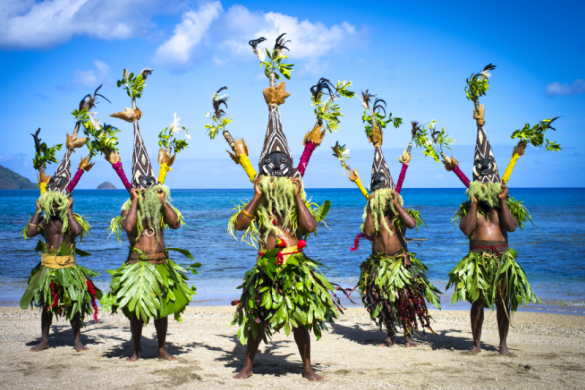 You will learn how eight years ago Carnival was only cruising approximately eighty thousand people to the South Pacific and in this year of 2014 Peter informs us that they should give over 1 million people the Vanuatu cruise experience. 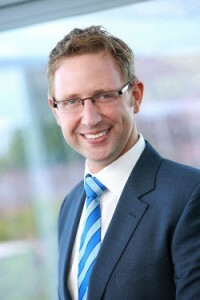 Peter joined Carnival Australia in October 2011 and leads media communications, government relations, community partnerships, sustainability, events and staff communications for Carnival Australia and its brands. Before joining Carnival Australia, Peter spent eight years with Telstra including roles as Group Communications Manager and media spokesman. Peter has also worked with the Victorian state government, Disney and PR agency Porter Novelli. His campaigns have received multiple industry awards and Peter has recently been appointed a judge in the B&T Awards. Brian: Good day Richard, Seems like we always have guests from Australia whether they’re actually there or somewhere else. They seem to be born and bred in Australia. And Peter Taylor is with us today, one of the Carnival group vice presidents dealing with the Australian brand; I believe Vice President of Corporate and Government affairs joining us on the program today. Peter welcome to Richard Butler’s Lifestyles and Real Estate of the South Pacific. Peter: My pleasure thanks for inviting me along. Brian: Glad to have you on the ride today but more importantly we want to hear about the ride that you send millions of people on each and every year. Peter: Thank you and thanks for your interest in cruising. It has certainly become the talk of Australia in recent times, We’re cruising and certainly the impact it’s having in the Pacific island region, is quite extraordinary. It is the water cooler conversation down here because everyone seems to be taking a cruise. I think back years ago when maybe 100,000 Australians were taking a cruise each year. And next year we anticipate there’ll be one million Australians taking a cruise holiday. And I guess they’re doing so because of word of mouth. Their friends are taking a cruise, and are doing a lot of the ‘myth busting’ about what cruises are and what they aren’t. We’re hearing about how extraordinary the locations are that our cruise ships visit and then they go back for more. So the Carnival Group itself which I represent; make up 8 brands locally in the Australia, New Zealand, and the Pacific region. And the core brands are P&O, Princess and Carnival Cruise Lines. 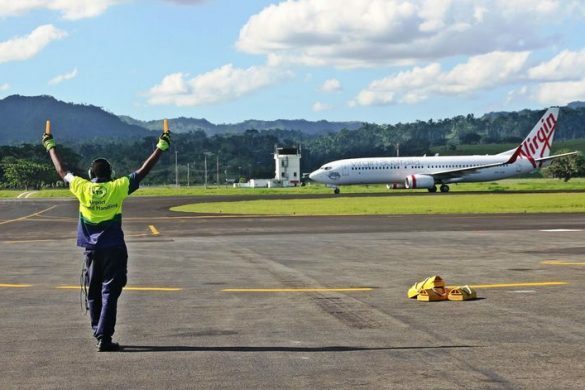 The Pacific is our backyard and I hear Vanuatu where Richard of course is very, very prominent, is a true home in terms of where we go with our passengers. We’ve been going to the Pacific for 80 years and the numbers just continue to go up in a record scale. Brian: Well you know one of the things that I like about the cruise that I went on, I’ve only been on one, was the fact that when you pay your bill, minus some excess drinks that you may purchase and of course your gifts; your room is taken care of, your food is taken care of, in many instances the entertainment is taken care of. It’s all in one price. It’s like a buffet. Peter: I think there’s a plus sign on one of the key appeals for passengers that you pay up front and if you choose to, you don’t have to spend another cent when you’re on your cruise. So with all the food and entertainment taken care of, hopefully the passengers will discover more than buffet food available on board the ships. I think most ships do still have a bar-side top area but that’s one of many different restaurant options that passengers find. The other two things is that people love about cruising when I talk to them is that you unpack once; so you unpack your bag just once. You don’t have to go through customs or airport security but once you’ve unpacked once that’s it you’re done and dusted for the cruise so you actually sit down and enjoy yourself right way. And the third thing that people love is that just about every day you wake up to a brand new vista. You wake up, you open the curtains of your cabin and you’re here at Mystery Island or Champagne Bay. And there’s something about the weather that always seems to be smiling upon us. Brian: Well I’ll tell you what. I’d love to see what it looks like from that side of the world. You mentioned cruises from Australia to Vanuatu and I know Richard has a lot that he wants to say about those kind of cruises. Richard welcome. Richard: Thanks Brian and Peter thanks for coming on to the show. You know Peter I’m a great fan of Carnival’s. 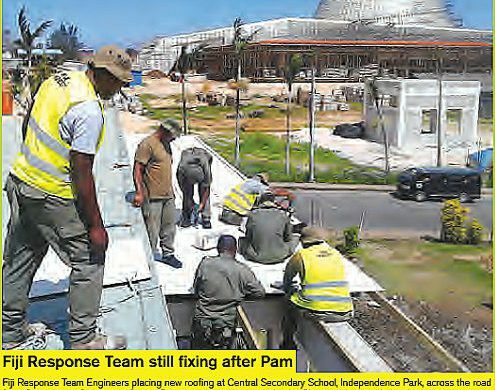 And of course of you often talk about how your managing director Ann Sherry promoted this project and how it’s expanded through the South Pacific. Just while we’ve got a lot of people who listen in the States, how would they get down from places like, Los Angeles to actually catch the cruises out of Sydney; ’cause you’re based in Sydney aren’t you? How many ships are based in Sydney now? Peter: We have a home fleet. At the moment we have 2 sorts of cruises that operate out of the region. There’s the home for the brands, the ones like P&O, Princess, Carnival Cruise Lines they’re based in Australia. Home port is in Australia all year round. And then there’s the Cunards and Seabourn in America. And the UK version of P&O they come over here seasonally. So they’re here for a 6 month’s summer deployment. 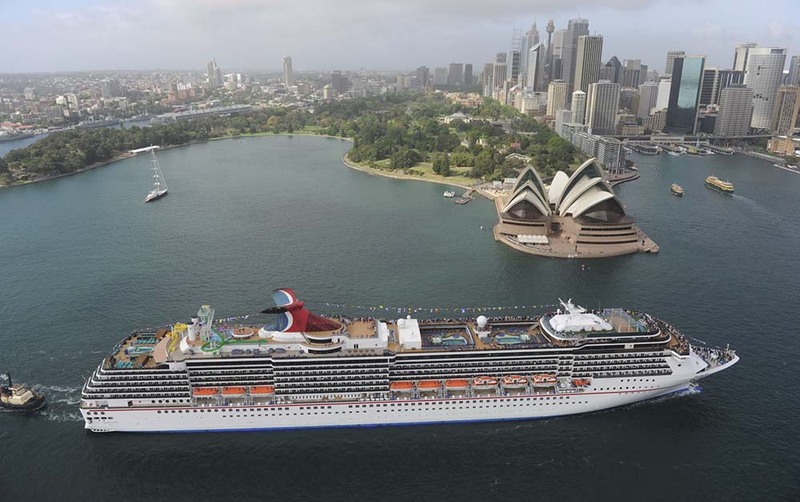 Sydney is the biggest gateway for cruising in Australia. We have two P&O ships, we have Carnival Spirit which is from Carnival Cruise Lines, and we generally have one or two at least, Princess Cruises based in Sydney. The cruises are also departing from home port out of Brisbane and Freemantle and we haven’t yet announced the exact deployment plan for next year. But we are going to be having 3 new ships; 2 P&O, 1 Princess based in Australia basically all year round, and these ships will be handing out new employment. 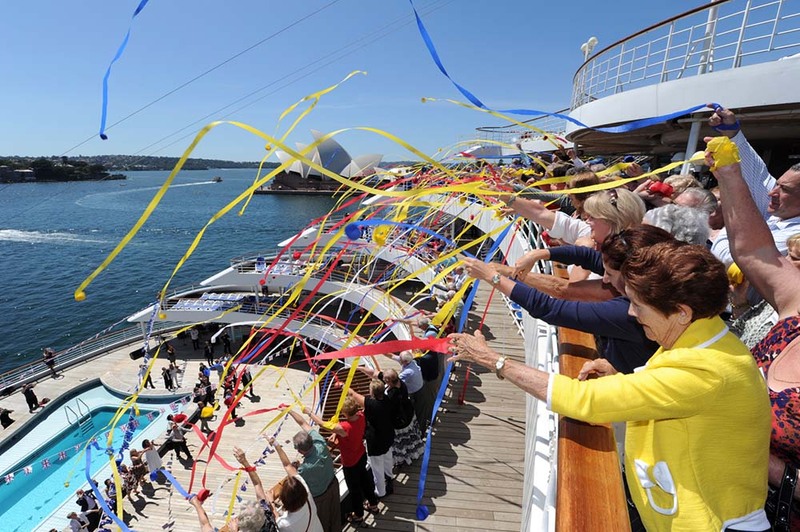 So you may well see more cruises going from north Australia or from Freemantle or Melbourne. So that when visitors from the US fly over, they don’t have to go from Sydney. Sydney is one of the most beautiful departure points as you’ll find going under theHarbor Bridge and past the Opera House. But there are many places you could leave Australia for to head to the Pacific. And I think ultimately people try and make the connection between the Pacific and the Caribbean or Beau Caribbean as the Friends of America would say. But for now, I don’t know about you Richard but I think it’s a very different world. The Caribbean certainly has got its appeal but I think the Pacific is unbeatable. It’s unique and so maybe that’s why it’s untouched. The islands you see and the people you talk to when you’re there with the locals are ; it’s not mass marketed, it’s not a mass produced tourist experience. When you depart a cruise ship on your day tour, and you go down and you meet a young woman who takes you to her house to cook for you that’s absolutely genuine: it’s totally authentic. It’s all these sorts of budding stories of what locals are doing in the Pacific which truly excites me a lot of the time. Brian: You’ve intrigued me man. Richard: It’s totally unique. I was just going to say Peter, it’s very eco, how do you say, eco-tourism cruising. Is that a word? Is that a sentence? It’s really an understatement. Peter: Richard if you want to use it as a word, we’ll say it’s a word! I think it’s a good word but I think also one of the great beauties about cruise ships, is that they leave very little footprint on the places that they visit. You know, many types of tourism need a big airport, a big landing strip, you need hotels, and huge road infrastructure to accommodate the 2 or 3,000 passengers. Well 2 to 3,000 people on our cruise ships, we often just drop anchor and have our tender vessels move passengers to and from, and the locals can help take care of them. Sometimes the community or the country or even the Australian Government might help invest in a jetty, which is where the ships can pull alongside. But that really is the only footprint that remains. We’ve make sure that the beaches are left spotless at the end of the day’s visit. So in terms of the local beauty we like to think that our visitors take away their memories but they don’t damage the locations in the process. Richard: Well I know Champagne Beach in Espiritu Santo Island is just absolutely magnificent and everybody is stunned by the pristine beauty of the place. You know when you were talking about the word of mouth; Where I live just down on the corner there’s a pensioner lady and her husband passed away. The other day she grabbed me and she said, “You’ll never guess where I’ve been”. I said, “No, where you’ve been?” She said, “I’ve been on a cruise to Vanuatu”, and I really enjoyed it”. And she said, “It was great”. And like normally, I just wouldn’t expect her to sort of be uplifting and heading of all over the seas on her own. “I went and got a passport and away I went”. Brian: Peter if I may ask, how long does it take to cruise from let’s say Sydney to one of the ports in Vanuatu and how often do those cruises take place? Peter: Well the Pacific is the number one location that cruises go from Australia. 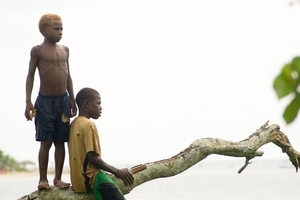 It takes a couple of days, a couple or 3 days to get to Vanuatu. But one of the great things, once you’re there is that, day after day you’ll see another beautiful location that’s very different from the one you were at before. Richard is the local guru when it comes to Vanuatu. They are such unique destinations, each one of them actually. Each day you get to wake up to a new one. So it is a couple of days of sailing to get there; and I can assure you that the moment the cruise ship pulls up at Port villa or any locations, the passengers, all 2 or 3,000 of them are very quick to get off and make the most of the day. Brian: And are you finding month in and month out that more and more Aussies or people that may start their vacation in Australia are now taking a cruise over to Vanuatu? Peter: Yes, we have seen 20% increase and those are passenger numbers out of Australia for the cruise industry of which the Carnival group makes up about 75%. But I’ve been seeing every year double digit growth for 8 consecutive years. So its interesting last year we had about 20% growth in passenger numbers. The year before was 20%; the numbers are massive. In fact what has happened last year is that Australia has overtaken the US to become the number one cruise community in the world. So again maybe 5 to 8 years ago Australia wasn’t what you thought about or when you thought about cruising. People weren’t taking cruises they had this old misconception to what cruising may or may not be. But today, the per head of population we have more Australians cruising than any other part of the world. So we’re really proud to have been a part of growing that. 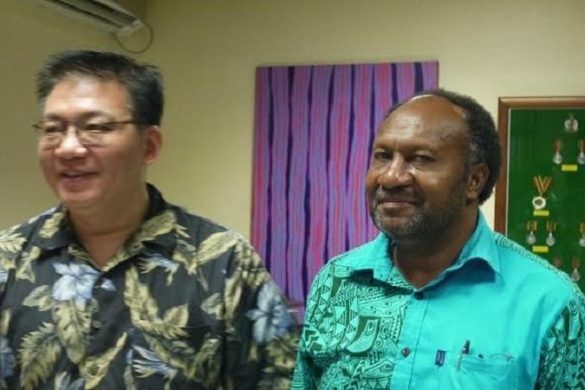 One of the key reasons for that growth, is because people are discovering places in the Pacific and certainly in Vanuatu. Brian: And Richard that must make you feel very, very happy. Richard: Yes. Like Australia the Pacific is now open for business and the people of the Pacific are realizing that they have to supply excursions and opportunities for these visitor to come and enjoy. Normally where the Carnival Cruise Line call in, you find the market’s so spread out and you can get off the boat and go walking through the markets for at least a couple of hours buying all sort of hand made goods; Sarongs and canoes and those sorts of bits and pieces like bows and arrows which they make. And it’s a wondrous time when the ship comes in they are what we call “floating banks”. Each individual person that comes off the ship is spending a couple hundred dollars a head. So you multiply that by fourteen hundred, two thousand people. That’s an injection everyday of a substantial amount of money into the local community, into the markets, the tour operators, the bus drivers, the taxi drivers etc. So Carnival’s doing a great job in helping the people of the Pacific become part of the international tourism concept. I think you’re doing a great job Peter, you’re also doing a study, on the effects of Carnival all the way through the islands? Peter: And credit to the success of the island doesn’t belong with the organization that owns the cruise lines; it’s very much totally due to the folks in the region who help make the cruising experience so unique. Certainly onboard, we can control the environment but ultimately passengers go to see the destination. And the people of the Pacific are so clever and funny, they find entrepreneurial ways to make the Pacific more and more appealing. So the people come back to us time and time again. In terms of the study, you were working with the Australian government to find ways to ultimately have as big an impact as possible in the region as we can. So we want to make sure not only do our ships continue to be welcomed by the locals, but we make sure that we leave a really positive lasting impression. Certainly the money that the locals make from selling tours, or selling their items, or selling their food is great. But we want to find new ways to make sure that we’re having a significant and long-term, positive impact in the communities where we visit. First thing we do for example is, every crew member and every passenger on board one of our cruises automatically donates one dollar each time they cruise. And that money goes towards “Save the Children” which is a not-for-profit organization. 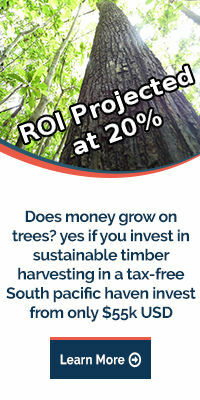 And then the money goes to build kindergartens and primary schools and health aid posts in Vanuatu. And they’re raising many, many, hundreds of thousands of dollars every year which is fantastic. 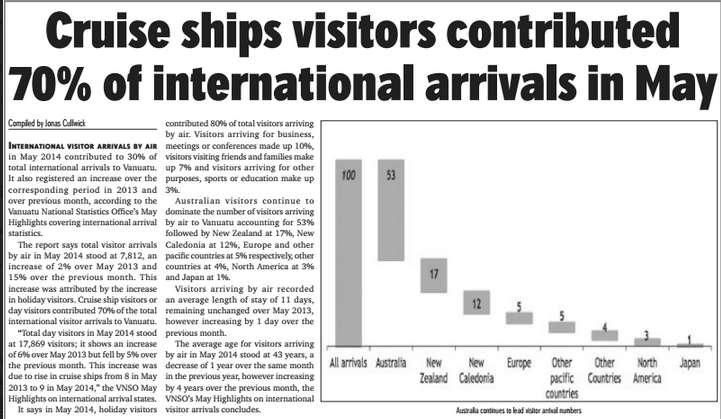 But what we’re doing with the Australian government now is some research; this helps us quantify exactly the dollars that cruise passengers are contributing toward the Pacific, but certainly Vanuatu each time that our ship cruises. And that’s going to help us and also the Australian government and others that make decisions for the long-term about how we invest money. 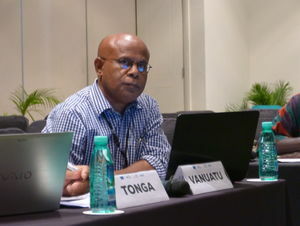 So for example there may be some suggestions in the report about new areas where we should be exploring in the Pacific; or finding new opportunities for employment out of Vanuatu. Already we have a commitment of 10% of our work force in the hotel part of the ship being a Ni-Van crew member. But we think there’s more to look into in many different areas to make sure that the cruising contribution to the Pacific is as generous and positive as it can be. Richard: Peter, What sort of dollar cost is it for the listeners to come and have a cruise? Where do the cruises start from and where do they go to? And I would say that the top of the range cruises are also valuable where you’re actually sitting in luxury upon luxury. What is the cost factor for people listening to come cruising on Carnival in the Pacific? Peter: One of the great things about the Carnival Group is we have so many brands that each brand targets a different segment of the market. And has a different niche of itineraries, has different demographics and certainly has a different price point for passengers. We have for example, the contemporary brand of P&O Cruises and Carnival Cruise Lines. They’re very much focus on the family and fun market. And then there’s the Cunard with Queen Mary II and Queen Victoria and Queen Elizabeth. They were in the Carnival Group. And at the top of the line is Seabourn which is the ultra-luxury, six star cruise ship. It’s very small, very, very boutique, has the French champagne on tap. Similar price to the Seabourn ship and the P&O or Cunard Cruise Line ship is notable. Cruising really can start in terms of local Australian dollars; it can start from as low as 50; 75 even as low as $50 per day per passenger. But on average particularly for the contemporary lines you can get for $100 and $150 per passenger per day. But again that includes not only your trips to Vanuatu or to the Pacific it also includes every bit of food you can have; and includes entertainment. It includes all the onboard activities. So the price appeal is certainly very strong but again within the Carnival Groups are plenty of brands. We certainly hope we have something to appeal to every taste. Richard: Also you know, most people these days know how to go to YouTube. And if you go to YouTube and hit P&O or Carnival in the South Pacific you’ll see many, many videos that will give you an idea of the vision, the beautiful vision of these magnificent white ships slipping through the island chain and pulling up outside these beaches. And then you’ve got clips also of people who have done the day tours, who have gone to the rivers, the falls; gone to the fishing ventures; scuba diving; gone to the local restaurants, the Millennium Caves on Espiritu Santo Island is another tour. There’re so many things they can do, when the ship pulls up. And then retreat to the boat that afternoon, late that night and then the boat head off again to another island. It’s so pretty to see your ships in Port Villa and especially at night when they’re lit up like a Christmas tree and they slowly slip out of the harbor. I don’t know what’s better; watching them coming in the morning or watching it go at night. In the morning you see them coming off the horizon – a little dot – before you know it it’s a great big white magnificent ship that pulls up in the bay. Looks absolutely beautiful. Brian: To what extent does your cruise line cater to that particular person who may want to go on a cruise for a couple of weeks but still wants to work for a couple of hours maybe 3 hours each day while they were on the cruise. What amenities are set up for them? Peter: Well there should be Wi-Fi access and so you can access the world through the phone or through the internet. Sometimes there’s a need to have a window time when you do check your email and you make sure that the world’s under control even though you’re spending, or you spent the day sunning yourself on a beach or exploring a rainforest. And so there is Wi-Fi access across the ships, access to the internet. It’s not a record speed. We’re talking about using satellite to connect the phone or the device to the world through the internet You won’t likely have the internet speed you have in your home or office in the States. Brian: Richard you have an interest in cruising from point A to point B in your own country? Richard: Australia is a continent. It’s almost the same size as America. We’re an island. So we’re actually talking about cruising the islands. Sydney Harbor you know is absolutely beautiful – just a work of art. The Carnival actually does special events and one of them, of course I love, is the Melbourne Cup. Peter: The Melbourne Cup is the race that stops the nation if not many parts of the world but it is an extraordinary horserace that is part of the fabric of Australian culture, regardless of if you’re from Melbourne or Sydney or Brisbane. No matter where you’re from in Melbourne, in Australia, everyone stops to watch the Melbourne Cup. One of the other great things about Melbourne Cup is people get really dressed up and wear fascinating outfits. 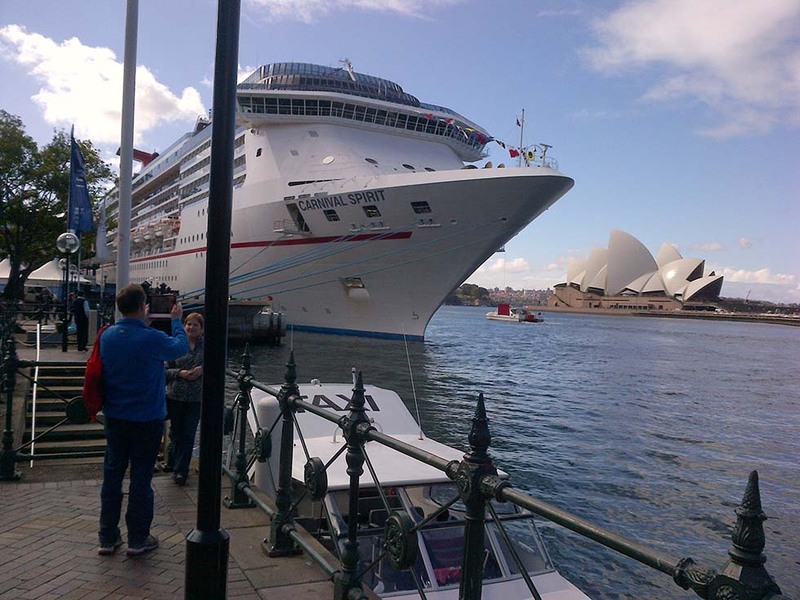 But we thought we’d try something different and now, we’ve been, actually it’s been several years taking a cruise ship from Sydney down to Melbourne with 2,000 passengers to experience the Melbourne Cup. And in fact this year we’re going to have for the first time 3 cruise ships based in Melbourne for Melbourne Cup Day. So, 2 from P&O and 1 from Carnival Cruise Lines, So you are going to have all 3 P&O Ships and the Carnival Cruise Lines. The maximum carries 2,000 about 2 ½ Thousand passengers. So just imagine being on race day when a few hours before the race and all the ships are pulled up along Station Pier in Melbourne and thousands and thousands of people who’ve come from Sydney walk off the ship not carrying a suitcase but instead dressed in their glamorous outfits for and hair pieces ready for race day. 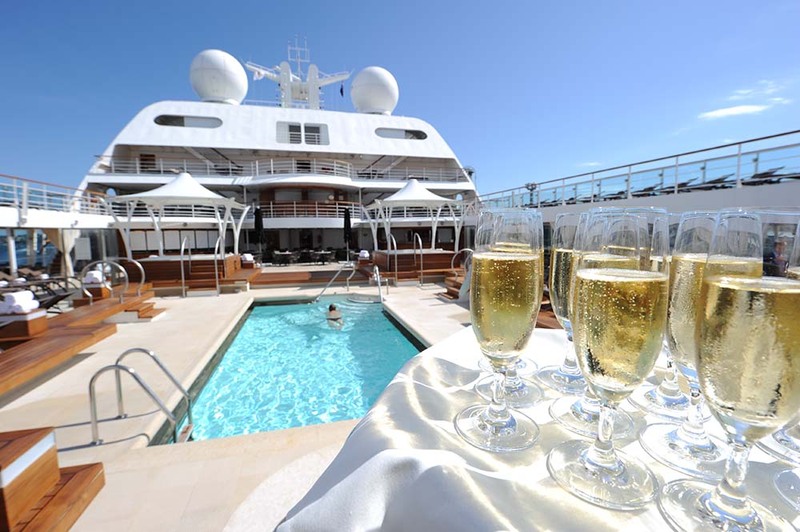 The Melbourne Cup is one of the special events cruises. We do a few of these big special event cruises. Another one is the tennis, the Australian Open. We take people from around Australia down to Melbourne and almost use the ship as a floating hotel for those days. And so the cost of your cruise pales into insignificance compared to what you’d pay for a hotel: at least 3 times as much. So you even get access to a lot of these events at the peak times. But cruising around Australia is probably an area of massive growth. The Pacific’s known as cruising gold mine. It has been a favorite for a lot of folks for many, many years. But Australia and all the regional parts of it have been fairly slow to realize the potential of cruising. But what’s happened in the last few years is, we’ve opened up so many destinations around all these different parts of Australia. So for example you could leave Sydney or Melbourne or Brisbane or actually many cities. And if you like food you can do a 5, a 4-port Cruise so you get a taste of like Asian in New South Wales. And then you go to Mornington down in Victoria and Portland down the Great Southern Road in Victoria. And then Kangaroo Island in South Australia. There are also great food and wine rates. If you love food and wine you can do this for a week and you come back with your suitcase full of food. The thing I was just saying is of course the Gold Coast is as huge a cruise destination. But places like Port Macquarie and the Whitsundays are certainly the most popular destinations for cruising locally. Richard: Well I’ve been a developer in the Whitsundays as well as being over in Vanuatu and these islands that are of the northern part of Australia, off the northern part of Queensland. There are 74 islands up there which is a part of the Whitsundays and you know I’m like the guy that has 2 children, twins and he can’t tell you which one’s better because he loves them both. I love the Whitsundays and I love Vanuatu. So if you want for me to give you an answer which one to come and see, I’m gonna have to say make time to come and see both. That’s what you’ve got to do. Peter: I have to agree you’re absolutely right. If you’re coming from North America it takes 12 hours, 24 hours to get here so make the most of your stay and relax and enjoy a bit of Australia. 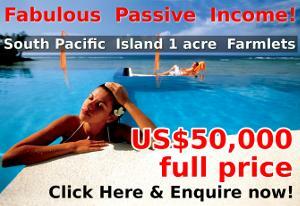 But then take a look at our extraordinary Pacific island backyard and extend your trip. If you’re making a trip over make it one you’ll remember for many years to come. Richard: What’s your web address and how can they find out about these cruises Peter ? Peter: Website which is carnivalaustralia.com.au and that includes the link to all the different brands within the Carnival group. So branded together the P&O’s and the Carnival Cruise Lines, all the way to Princess and Hall of America, Seabourn, and Cunard. So carnivalaustralia.com.au is a good starting place. 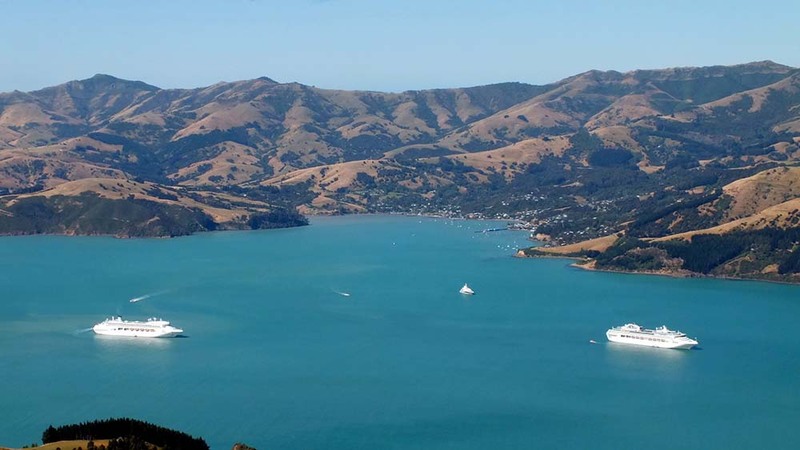 Peter: Now the New Zealand is certainly a booming cruise industry and some of the areas of New Zealand are so magic for cruise where I think the parallel I draw is between Alaska and New Zealand in terms of the beauty and the diversity of New Zealand. But New Zealand is a great destination. It’s also a great place for passengers to start their cruise from. 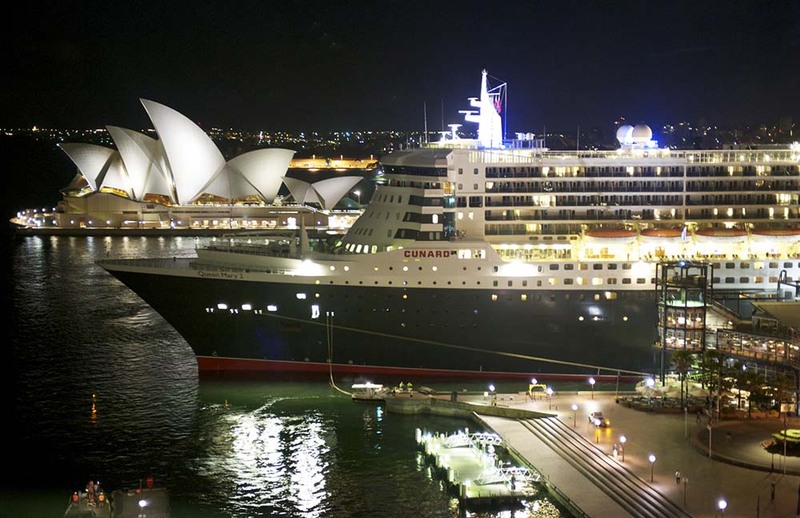 But the cruise that I think, remember most of all is Queen Mary II out of Sydney and I think any cruise you can try – maybe if it includes a trip past the Opera House on a summer morning – it’s worth adding to your trip at least. Brian: Let me ask you this Peter, of all the times that you’ve gone on a cruise, if you think about the Pacific islands, which has been your favorite cruise to which destination? Peter: My favorite cruise; okay well I have a bit of a bias I’m fairly privilege and I get to go on a cruise ship every week of the year. And I get to spend a lot of time doing cruises. I’d never cruised until I was joined the company 3½ years ago. But my favorite cruise experience is when I cruise with my friends because I love sharing the experience and so what I’ve liked most is actually probably going to an island called Marray. So it’s in New Caledonia, it’s one of the Loyalty Islands in New Caledonia. I hope I didn’t answer improperly before Richard but our cruise is among the best in the Pacific. We gave Vanuatu number 1 and New Caledonia, Fiji, hopefully in the not too distant future Samoa. But Papua New Guinea has also become one of our biggest, our most popular cruises of late as well. So not only was it a beautiful destination to show off to my family when I was cruising with them. But there was also a really magic experience to so sort of see how this island had really worked itself up to prepare for the arrival of 2,000 passengers and give them a day that they won’t forget for all the right reasons. Richard: You know Peter thank you very much for coming on the show today. It’s been great hearing about Carnival and your stories and you know we loved to. I’m a big promoter of Carnival and I tell all my clients, I should have a look at cruising. And now we’re telling everybody in Australia and hopefully coast to coast through the States. We say from Panama to Paris are hearing you and throughout the South Pacific. So thanks for coming on the show and I will be booking that trip down to the Melbourne Cup and I’m on your cruise boat. And I’m going to look forward to that the rest of the year until this November. So thanks for coming on Peter and we’ll talk to you again soon I hope. Peter: Thanks Richard and thank you I think on behalf of the region for giving this here part of the world the exposure that you do. We’re very privileged and I thank you for that; for giving us, for giving the world a close look at what people haven’t discovered quite like we have. Richard: Well thank you Peter. Brian: Wow! What a fantabulous guest that we had on the show today. Richard you know what I like about the idea of all these cruises going out to the numerous islands in the South Pacific and in particular in Vanuatu is that people get the opportunity to go off the boat and look around. So my question to you would be, you’ve got oh 100, 200, 300 maybe more people getting off a cruise ship on any given day of the week. How do people then scout the area to see if this might be a place for them in the future to want to come back and vacation, to live and invest maybe even live full time or start a second career? Richard: Good question Brian but I’ve got to correct you unfortunately on something. We’re getting a cruise boat every day and a half into Vanuatu. And each cruise boat has got fourteen hundred to two thousand two hundred people getting off the boat. And the islands are having to catch up. They’re going to have to catch up quickly and provide the services for these people. And so what happens now is that we have buses. All the people in Vanuatu on the other islands they have all these little 6 and 8 seater buses to transport people around. And there are all the different tours. And the people on the ships can book the tours from the tour desk obviously on the ship while they’re cruising and they go off on these different trips which are very well organized. 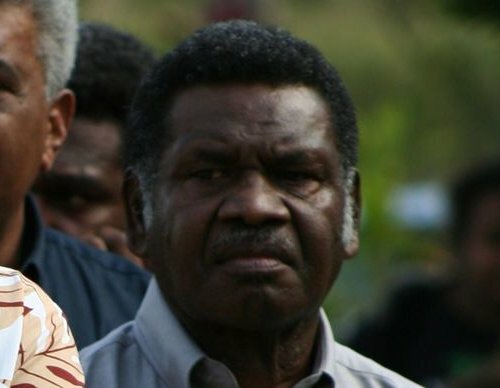 One group in Vanuatu has actually grown from just 1 or 2 buses. And he’s grown in to a fabulous little business. And he’s got about 10 or 12 buses now. And he’s picking people up and doing the tours. We intend to start doing some servicing ourselves in real estate tours off the ships as well; to take people off and show them our estates. That one I was talking about is called Evergreen, Evergreen Tours and they’ve as I said, they’ve started with only one or two buses and now they’ve got; I’ve got a picture here they’ve got, I can see 10 buses in the picture and a staff of round about 20; 30 people plus the mechanics maybe 40 people. That’s what Carnival is doing and tourism is doing to the South Pacific. But going back to the real estate. Brian: Just one second; as you say that is there still opportunity for somebody who might want to be a tour guide to go to Vanuatu to become a tour guide? Richard: Absolutely. And well, you’ve got to have people skills. That’s the first thing you gotta have. We don’t want Mr. Grumpy driving around in a van. But, if you’ve got good people skills and you genuinely like people, yeah the opportunities just abound you know. 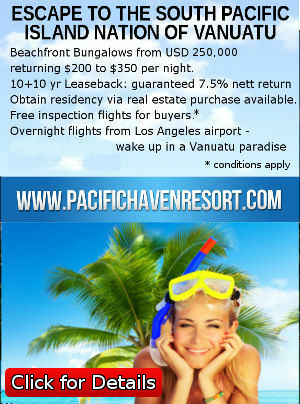 There is no shortage of opportunities in Vanuatu and opening up like you wouldn’t believe. As I said before when I first went there in 2008 a cruise ship used to come maybe once a fortnight if you were lucky. And it was such a big thing that they used to write in the paper what to do in Vanuatu today. Well now they’ve got a cruise ship coming every day and a half; basically the harbor’s got over $100 million worth of development. By 2016 I think we’re going to have 3 berths for 3 cruise ships in Port Villa.